Doing the eco-tour of Otago Peninsula is like going on safari with the FBI. It involves being undercover and listening to people whispering into walky-talkies. Our guide pops his head over the trench and replies, “Roger, roger. Penguin sighting confirmed. Repeat, confirmed”. Half a dozen of us are hiding in a windy trench. It’s the end of a long day tracking wildlife across the Otago Peninsula, one of New Zealand’s most important eco-tourism areas. Now we’re at Penguin Place, a private conservation reserve that’s home to the shy yellow-eyed penguin, a native species. Penguin Place has built a system of tunnels around the hills, so you can sneak along without alerting the penguins to your presence. The sandbags and camouflage give the trenches a war-time feel. Perhaps ‘habitat’ isn’t the right word to use when describing what is, essentially, penguin suburbia. Penguins traditionally nest in tree roots, which were once plentiful in this region on the coast of the South Island – until the sheep farmers came and cut down the trees, leaving the penguins homeless. When the sanctuary was created in 1985, there were only eight pairs of birds left. 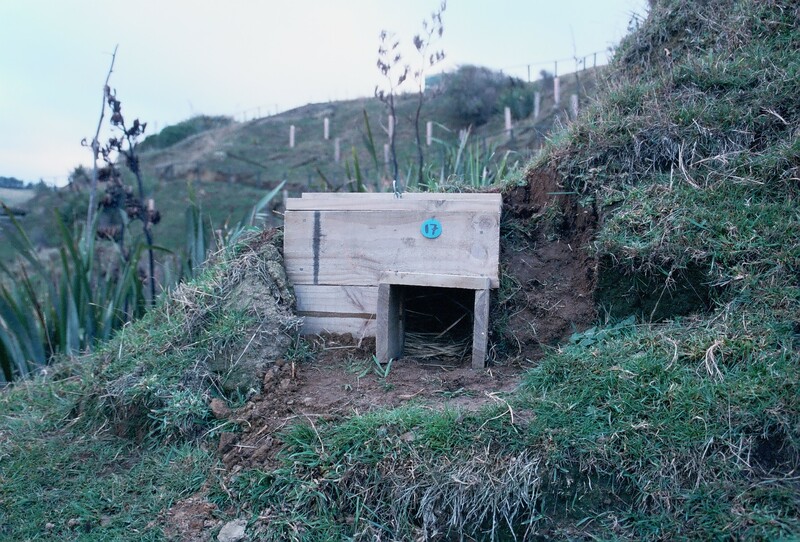 The sanctuary’s solution was to build nesting boxes on the hills. The blue penguins get little pine bungalows, each with a number painted over the door, while the yellow-eyed penguins get 70s-style triangular houses. It looks like a penguin housing estate. At that moment, a yellow-eyed penguin is sighted and we race off to another trench, to peer over the slats. At first it’s hard to see the penguin that’s arrived on the beach. Penguins are initially scared to show themselves, in case a sea lion gets them. To protect themselves, they lie in the water, beaks sticking up, until they’re certain they’re safe. Then they make a dash to the sand dunes. Ironically enough, all this subterfuge is wasted energy, because sea lions won’t attack them on land. But nobody’s told the penguins. That is one of many facts I learned on my day out with Monarch Wildlife Cruises. The day began with a drive through wetlands, home to a huge variety of birds. Our guide John, every bit as gnarly as an eco-tour guide should be, could name every one of them: silvereye, jeweled gecko, Otago skink. Next stop was Taiaroa Heads. This outcrop, covered in ruined fortifications, is the only place in the world where the extraordinary royal albatross touches land. The nests of these cherished and heavily protected birds can only been seen by climbing a steep hill, passing through several gates, and then watching from behind windows. The royal albatross, with its three-metre wing span, is a glider. It spends most of the year perched on air drafts, being driven around Antarctica on the roaring forties. Occasionally it drops down to sea and fishes. Once every two years, albatross pairs return to Taiaroa Heads to breed. Chicks take eight months to reach maturity, so there are usually some for the tourists to see. The chicks are fluffy white things that stay put on one patch of grass, waiting for their long-suffering parents to bring them dinner. Eventually, the chick takes off on a journey that can last six years. By the time it returns, it’s lost the use of its legs. “They go thump, thump, thump, THUMP!” said Warren, the sanctuary guide, demonstrating how chicks crash land. While the chicks are senseless, the ornithologists rush out and tag them. After the excitement of the albatrosses and lunch, John sailed us out past Taiaroa Heads—straight into Antarctic winds. I was the lucky one at the front of the boat who had a wave of freezing water hit me. “Are you OK?” John called, throwing me a towel. I was too cold to check. In contrast, the sea lions at the base of the Heads lay around soaking up the sun. And I finally found out what a ‘shag on a rock’ is—it’s a cormorant that makes its nest from excrement. “It gets pretty whiffy round here in summer,” said John. In a day of excitement, the highlight is definitely seeing a fairy penguin porpoising up and down through the water, thrusting itself along at top speed, on its way home to Penguin Place. We tourists go “aaaaaah” and agree that being around these wonderful animals puts us in touch with our own humanity. Though it doesn’t do to get too sentimental about wildlife. As darkness falls, and we watch the last penguins toddle home, we’re reminded of just how ruthless nature can be. There are these two penguins standing on the same path. One’s a yellow-eyed penguin and one’s a blue and they don’t seem aware of one another. Until, that is, the yellow-eyed penguin has a sudden fit of road rage and whacks the other one off the path. Then he waddles home to his bungalow. It’s true—the penguins are just like us.